Organized by students from the academic societies of the School of Business, Deree Business Week celebrates its 12th year on March 17 – 24, and continues to strengthen the links between the business and academic environment. The aim is to create the framework for a fruitful dialogue between students, graduates, and the audience, with prominent figures from local and international businesses. This year’s theme of “Crossing Disciplines” focuses on the synergy between business segments of different disciplines and subjects, and the resulting advantage of flexibility for businesses and their employees; a trend that is gaining ground rapidly. Through various lectures and workshops, presenters will share their experience from both a personal and business perspective, opening a creative dialogue. The event will kick off with opening remarks by Provost Dr. Thimios Zaharopoulos, and Dean of the School of Business, Dr. Annie Triantafillou. ACG is also honored to welcome back on campus Geoffrey R. Pyatt, U.S. Ambassador to Greece, to close the event’s opening ceremony. The keynote speaker of the event is entrepreneur and venture capitalist, Apostolos Apostolakis. Leading the Greek startup scene, Apostolakis has acquired Taxibeat, doctorsanytime.gr, e-food.gr, while in the area of venture capital operates with more than 12 startups, including e-table.gr, nannuka.com and douleftaras.gr. 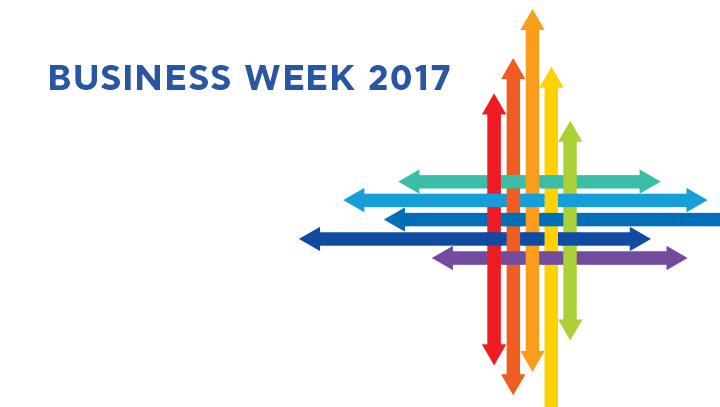 Business Week 2017 will host distinguished personalities from several leading businesses and organizations including: Dean Harris, JD, Professor at the Department of Health Policy and Management, UNC Gillings School of Global Health; George Apostolopoulos, Kosmos Business Manager, at APIVITA S.A.; Veroni Papatzimou, Partner / HR Specialist at KPMG; Alexander Mpontikoulis, Regional Category Manager at INTERSPORT Athletics; and Basil Sudborough, Marketing Manager/Export Manager USA & Canada at Selonda SA. Also sharing their insights and experience will be: Theodore Papadopoulos, Head of User Experience, Group Digital Banking at Eurobank; Michael Mavropoulos, Managing Director at TUI Hellas; Katerina Nikolaou representing the Hellenic Institute of Marketing (EIM); George Balafoutis, Cybersecurity Architect – EMEA, WW Cyber Champion Program Lead at Microsoft; John Vasilakos, Chief Operating Officer at Dixons Carphone South Europe; and George Xiradakis, Owner of XRTC Business Consultants Ltd. and President of the Propeller Club Piraeus, and many more! Business Week participants will receive a certificate of attendance provided that they attend at least 6 lectures and workshops. Students from other universities or stakeholders who wish to attend lectures and/or workshops should register via eventora as there is limited spaces. For more information on this year’s Business Week, and the full program, please click here.